One of the most interesting things we see in the motorsports industry is the ability for companies, new and old alike, to innovate in areas where we think we’ve seen it all. While anyone who’s been involved in auto racing for more than few years knows about advances in Nomex® underwear to make it lighter weight I, and I’m sure many others, just assumed that Nomex® tech layers had essentially reached their pinnacle. What sets the Walero lineup of Nomextech layers apart from others isn’t simply the thickness of the material but rather the material itself. Walero uses a literal space-age material developed by NASA for off-world applications to regulate body temperature based on the environment (i.e. ambient temperature). It’s called Outlast® technology and it really is the stuff of science-fiction books written in the not-so-distant past. 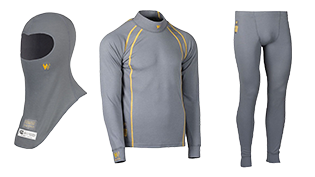 Garments made with Outlast® technology use thermo-regulation to both keep you cool when the temperature rises and keep you warm when the temperature drops. This reduces perspiration by up to 33% and, as most racers already know, perspiration leads to dehydration and dehydration has all sorts of nasty side-effects that reduce reaction times and prevent you from putting down your best lap times and increase the odds of making a mistake. Another benefit of Walero Nomex® is their anti-microbial Envirotex treatment. This hospital-grade treatment is 99.99% effective against most common bacteria, eliminating a portion of the bacterial odors we’ve all become so accustomed to when opening our gear bag. In other words: less funk in your junk! Also, as has become the norm for high-end tech layers these days, Walero uses flat-lock seams and super-soft fabric to maximize overall fit and comfort. If you have any questions about these or any of our other products at CompetitionMotorsport.com, don’t hesitate to call us at 844-438-7244.